It’s always difficult porting a PC hit to consoles. We’ve seen some ports in the past, such as Diablo III: Ultimate Evil Edition, that have arguably exceeded their original games, while others have underwhelmed. When Larian Studios was tasked with porting over their complicated role-playing game Divinity: Original Sin over to consoles they had to make some major decisions with how the game played, and how it would work when played on a TV. Have these design choices paid off, or should gamers stick to using a mouse and keyboard for their role-playing endeavors? Let’s get this out of the way first, Divinity: Original Sin is a throwback to classic RPGs. If you’re a fan of pen and paper games like Dungeons & Dragons or old school computer games like Baldur’s Gate then you’ll feel right at home. Life or death situations will be decided on a roll of the die. While Larian Studios has done a great job of modernizing the genre, the reliance of chance makes it just as unforgiving as its predecessors. That isn’t to say this is a bad thing, as luck will sometimes be on your side as well. The idea of accidental occurrences having a huge impact is also found in the story of Divinity: Original Sin. Both of the game’s main characters are sent to investigate a murder case, but stumble upon several much bigger mysteries. One thing leads to another in the fantasy-filled world, and suddenly the player is tasked with saving the world. It’s a cliché turn of events, but the writing is so good that you’ll want to read every line of dialogue. The first area of Divinity: Original Sin takes place in the harbor town of Cyseal. It’s up to the player to solve the mysterious murder, and help out as many citizens as they can. In typical RPG fashion, almost every single non-playable character needs help with something, as your quest log will be filled up with dozens of quests almost immediately. While the thought of having dozens of tasks that need to be done can be quite overwhelming at first, it’s handled fantastically by the game. Your quest log is constantly updated with new information, telling you where to go and refreshing your memory on why you’re doing it. More RPGs could learn from how Divinity: Original Sin handles quests, as these detailed journal notes never left me confused on what to do next. While it’s largely peaceful inside the town of Cyseal, there are dangerous enemies lurking outside. Just like any good fantasy game there are orcs, skeletons, and other baddies to fight. 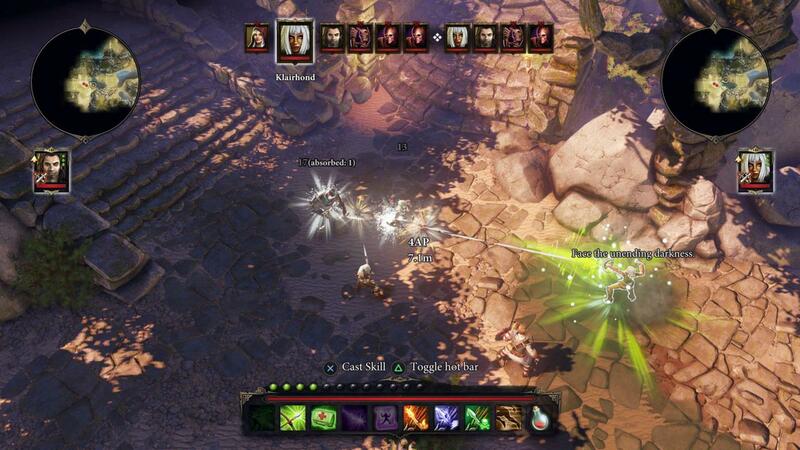 All of the combat in Divinity: Original Sin is turn-based, so players won’t feel rushed. This is good, since it takes a bit of time getting used to how the game controls with a DualShock 4 controller in hand. Each of the characters has standard attacks, and special skills they can use in battle. Every maneuver, including moving, takes up action points, so players will be limited in what all they can do in a single turn. In a pretty fun twist, action points that are unused carry over to the next turn. This means players can essentially rest a turn, and double up on actions next time. Larian Studios does a good job of explaining all of the mechanics in the game’s optional tutorial dungeon, and it feels like second nature afterwards. It’s pretty impressive how such a mouse-heavy interface has been painlessly reworked on consoles, and a credit to the developer’s ingenuity. This isn’t to say it’s better than playing with a mouse and keyboard, though. Early on in Divinity: Original Sin your party will grow to contain four different warriors. All of these characters need to be micromanaged, from their skill trees to what is in their backpacks. This means players will be switching between characters quite often. It’s a pretty simple process, hold the left trigger and then select the character with the right stick, but one that’s more complicated than simply clicking on a portrait in the PC version. Despite all of the user interfaces being redesigned for consoles, players will spend more time than they want to in menus. The inventory system is particularly complicated, since each player has a separate one, so you’ll have to switch to each character if you’re unsure who has a particular item. A way to browse all of your party’s belongings would’ve gone a long way in making it more accessible. So while there are a few rough spots in the interface, Larian Studios has done a fantastic job in making Divinity: Original Sin playable on consoles. But what is new? This is Divinity: Original Sin Enhanced Edition after all! Well, a lot of stuff, actually. So much that players of the original game might want to go through the lengthy RPG again. The biggest change is that players can now go through the adventure with a friend, as Divinity: Original Sin Enhanced Edition features both local and online cooperative play. Similar to the LEGO games, players can run off to separate areas of the same map (although this typically wouldn’t be the smartest course of action) without running into invisible walls or loading screens. It’s a seamless integration, so if players want to spend 60+ hours with their loved ones in Divinity: Original Sin they can do so. Returning players will be glad to know that while most of the quest lines have largely stayed the same, several areas have been reworked. This includes one of the game’s early boss fights, which has seemingly gotten more difficult due to the changes. Some major changes have also been made to the game’s story, with it featuring an all new ending. Some of the best additions come in the way of the game’s audio and visual presentation. All of the dialogue (and as noted before, there is a lot!) has been fully voiced in Divinity: Original Sin Enhanced Edition. The fantasy world also looks gorgeous, with the visuals really coming to life in the Enhanced Edition. If there is one real knock against Divinity: Original Sin Enhanced Edition it’s that the game has way too many difficulty spikes. Players will have to learn to save often, as wandering into the wrong part of a map, or stepping on a trap, can wipe away hours of progress in an instant. Players will have to play cautiously, and save often, if they wish to get through Larian Studios’ excellent RPG. Ultimately, playing Divinity: Original Sin Enhanced Edition on consoles is a fantastic experience. It may not be the best way to play, as PC still reigns supreme, but it’s a fantastic version of an already great game. If you’re willing to roll the die, and have luck decide your fate, then you’ll have a blast playing through Larian Studios’ update of Divinity: Original Sin.